Tuesdays with Dorie was the group that started it all, for me. I remember reading my first Tuesdays post...it was for "Madelines". My thoughts went immediately to "this is a group I want to be part of... baking my way through a cookbook...what fun". However, this group had met it's quota and it was not to be. I kept reading the posts periodically, and then about a year and half ago I read that they were starting the FFWD group! You know what happened next! 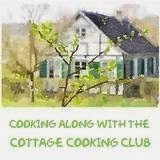 While the Tuesday group continued to bake their way through Dorie Greenspan's book "Baking, From My House to Yours", the Friday group got started cooking their way through..."Around My French Table". It took "Tuesdays" four years, but they finished their baking project and are now starting a new group to bake through "Baking with Julia"! I am finally part of the Tuesday group and am looking forward to the journey! Our first challenge...White Loaves. My mom was a wonderful bread baker. She was the one who taught me to get to know my dough, knead it...know it's feel. I have baked bread quite often, and always kneaded by hand. This recipe calls for using your stand mixer to knead the dough. Because, the dough seemed heavy I decided to use the mixer. At one point, I thought the motor on my mixer was going to give out. The dough finally came together and it made two beautiful loaves of bread. My first loaf was a plain white bread, absolutely delicious! I used it for sandwiches and toast. It was my kind of bread...not at all like the white fluffy bread you buy at the grocery store. Full of flavor and such a nice texture or crumb. For the second loaf, I rolled out the dough and spread it with some softened butter. I then sprinkled on some cinnamon and sugar...the results were very nice. Just a little sweetness for a breakfast loaf. I really loved this recipe and will be making it again. I'm thinking with raisins next time. If you would like to bake this bread, you can find the recipe in the book "Baking with Julia" by Dorie Greenspan. To see how other bloggers did with this recipe you can find it here. The recipe will be posted by our host this month Someone's In the Kitchen, here. Nothing beats a homemade bread just out of the oven!! What a great idea to add the cinnamon swirl! And, I thought my KitchenAid's motor was going to break as well. And I had just received it as a gift! Gorgeous loaves! Love how you added that cinnamon swirl. My KitchenAid actually stopped midstream and I had to finish by hand. Fortunately it's still alive, just didn't like the bread dough. I really wish I had turned one of my loaves into a cinnamon loaf - that looks wonderful. It sounded like this week was a rough one for quite a few mixers. Oh, so happy to see you in this group. My first recipe for TWD was the Madeleines as well. Your loaves here are truly beautiful inside and out and don't think I am not envious of that one with the cinnamon swirl because I am! Delicious! It's going to be fun seeing your entries each week...I always love the FFwD ones you do...just could not get it together to make that one work for me, but love the book and recipes. What beautiful loaves of bread:) I love your idea of making one loaf a cinnamon swirl one. I love your Fire King Sapphire loaf pan! Your bread looks absolutely perfect. I thought about making cinammon, too, but decided to stick with savory since it was my first time using this recipe. I agree - I will make this again! I'd like to try some savory fillings as well - like tapenade. Both loaves look wonderful! I've changed my dinner menu to go with what's left of my bread. Your bread rose beautifully, Kathy. So many did a cinnamon swirl. Next time I will try that. I am so glad that we will be baking together on Tuesdays with Dorie. Kathy-your white bread is absolutely incredible. I love the way it rose up, I can just smell the freshness, and the amazing flavor, and the light texture, with the perfect crust. I left a comment at Lizzy's that I would love the have a slice with jam on the bread w/my coffee...I see, your read my mind; now, could you please pass this beautiful slice? was a fun recipe and I enjoyed making bread from scratch. Bread really is the staff of life. That goodness in your photos says it all. Very beautiful bread. Seeing all the variations makes me want to bake it again! Your bread is just gorgeous, I love the rising photo, what a nice tall loaf. So nice to read of your baking memories with your mom, I hope I can provide those for my daugher (and sons if they are interested, which they are not at this point, but they are still pretty little). I'm glad you can finally get your tuesday baking on! This loaf looks fabulous. sometimes you just want a nice fluffy slice of white bread...and this is perfect. My goodness that ball of dough rose so HIGH! Beautiful. Isn't it wonderful to continue on something that you remember from your mother? Good luck with the new cookbook quest! Your breads look amazing! There is NOTHING like homemade bread! Just wanted to let you know I finally got around to passing the Liebster award forward. Thanks again for that and I look forward to getting to know you (and your recipes!) better in 2012! Everyone got such lovely looking loaves of bread, and yours are no exception! I love the idea of adding the cinnamon and sugar to make a breakfast loaf. Both breads look beautiful, Kathy! Looking at your photos is making me want to get another batch going.